Will bring gift for me. Jessica was at our home in Madurai for a four day visit. I told her that it was long time since we posted anything in her blog. So long a gap, I asked her whether she brought anything for the blog. She hesitated for a minute and then she said that she would give something. 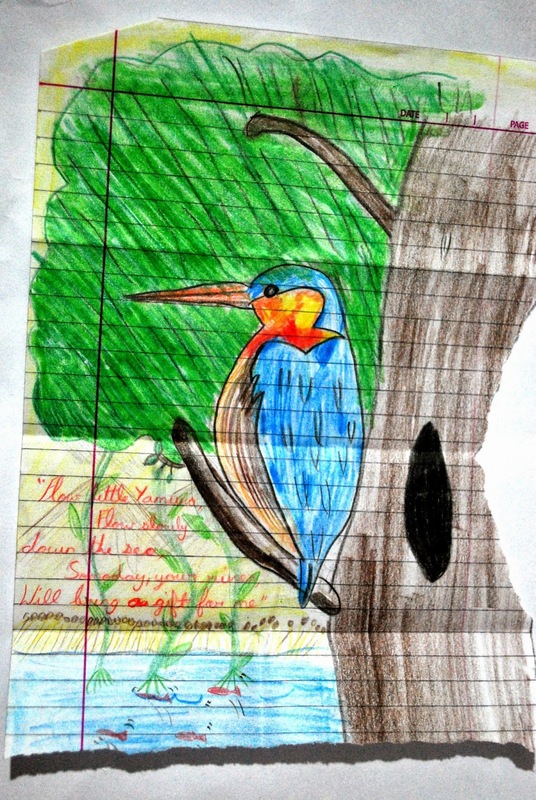 First she gave me a pix of a bird – on a roughly torn paper, drawn with the pencils available. Then she wrote two poems. Akbar and Birbal – she said that it is one of her prose lessons. She said that she would give that in poetry form. Then another one ‘mummies’ . Akbar sadi, “I’ll give a reward to the one to stay in overnight”. “Good luck, old fellow”, 1akbar said to the man. But all he could think of was the gold. “Your Highness”, he said I thought of the lamp. “He cheated ” said a courtier. “This man is a fraud. “Old man”, said the King, “You won’t get a reward”. He sought out Birbal, told him his problem. “I’ll prove that the king is a fraud”. “I’ll go “ said Akbar, “And see what’s wrong. The fire was low; Akbar asked why. He said “The man just thought of the lamp. So I’m doing the same to make my food damp. Rah … Rah … Rah. Rah … Rah … Mummies.